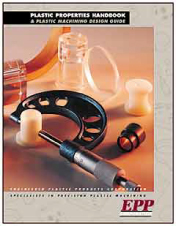 Precision custom plastic parts begin with the highest quality plastic machining materials. Engineered Plastic Products has been working with the country’s top plastic manufactures and vendors for over 40 years. During this time we have developed relationships with our material suppliers who share our commitment to quality and can provide us with all of the certifications our clients demand. We employ full time procurement specialists that work directly with our clients to ensure we always deliver cost-efficient short or long run orders. Our ISO certification can assure you we can delivery the best quality in every part from the tiniest washer to the largest housing part your design requires. If you still have questions about what plastic your machined part requires download our FREE PLASTICS HANDBOOK or CONTACT US to have a degreed application engineer assist you with your custom project. Click on any of the types of plastics below to read more about the machining properties of each.